On his 18th birthday David Lomon (real name David Solomon) left the UK to join the Republicans in the fight against Franco. "They advised me to change my last name to one less Jewish because to go fight the fascists, if I had the misfortune to be caught, it could help me to survive," he wrote in a memoir only a month ago. "The Gestapo came every few weeks to take German citizens and especially Jews away. My name change saved my life. " As a result of his altered name Solomon was put on a list of prisoners for exchange and release. He then went on to have a very long life, dying only last week. Solomon was one of the few international brigades still alive, and the last of the British. In total, there were 35,000 “brigadistas internacionales” who came from 55 countries and from a wide range of jobs including miners, lawyers and even leftist politicians such [German] Willy Brandt. When Solomon first left home he believed that Spain would win the war. "We were good," he recalled with a smile. But once here he discovered that it was in fact the weaker side he had chosen. "We had to make do with old weapons, mostly from before the [first world] war and with old Russian machine guns. The food was not much better: donkey-meat, sardines and beans were our staple diet. But we were so determined to overcome all the difficulties that we just accepted what they gave us and we carried on. After all, we had not come to Spain to eat, but to fight. " Solomon was impressed by the Spanish: "I was fascinated to see people so poor and yet so proud," he said. He fought in the Battle of Teruel and the Aragon offensive against Franco. A bomb just about killed him and the explosion left him unconscious for no telling how long. When he woke up, he realised he was a prisoner in a truck guarded by the Italian division of Blue Arrows. It was March 1938. He and others were taken to the former monastery of San Pedro de Cardena. Crammed in the basement, many of his comrades died from a lack of medical care and food. "It was awful. When you get into a place like that it’s as if you have left the world, "he recollected. 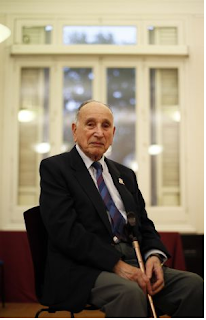 Solomon was proud of the Spanish passport he obtained due to to the ‘law of historical memory’ which granted citizenship to those from the International Brigades. Losing the Civil War was "a blow" for him but he claimed that it also served as an "inspiration" because when he returned to England, after being swapped for four prisoners Italians, he joined the Army and fought against Hitler after. "We won that war" he stated. A month ago he came to Madrid (for the final time as he was) invited by the Friends of the International Brigades to participate in events for the 76th anniversary of the defense of the capital city. Almudena Cros, from that association, recalled how he walked "with admirable verve" along the same streets that he had marched in…76 years ago when he first joined the XI International Brigade.